A digital concept showing the exterior of the proposed dome as well as its location. 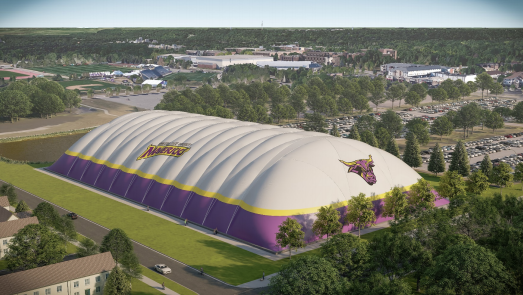 UPDATED Wednesday, Dec. 5 at 11:30 a.m.
Minnesota State Mankato students have approved their financial support of a seasonal sports dome. Voting polls were open Tuesday, Dec. 4, from 8 a.m. to 6 p.m. and required at least 1,078 students to vote ((half of the voter turnout for the spring Student Government election) for the votes to be considered valid. Students either voted yes, no or abstain for support of a referendum that would increase tuition by $.83 per credit capped at $10 per semester for the next 10 years beginning in fall of 2019. This increase would fund the additional $2 million needed to construct the $4 million dome. By the times the polls closed, 2,915 students casted a vote: 1,900 voted in support of the referendum, 997 students voted opposed to the dome and 18 students abstained. The referendum passed and now a recommendation will be made to President Richard Davenport seeking his support. The final decision will be made by the Board of Trustees in late spring or early summer of 2019. 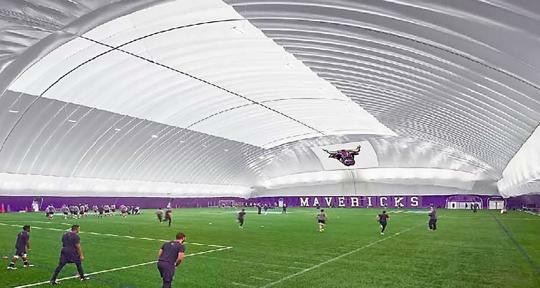 The sports dome or bubble, which will be located south of Parking Lot 23 just off of Monks Ave, will consist of three artificial turf fields, each about 75 yards long and 50 yards wide. A seasonal bubble will cover the fields from Oct. 15 to April 14. During those colder months, the bubble will be heated to around 50 degrees and include restrooms and storage space. The dome will use indoor LED lighting. Since the dome fabric will be opaque and gray there will be no light pollution from inside. The fields would be unlighted when the bubble is down. “This facility will allow us to transition many activities that are currently scheduled in Myers Field House and Schellberg Gym during the winter months on a court space to a more appropriate turf surface,” Todd Pfingsten, director of Campus Recreation, said. Pfingsten cited soccer, rugby, lacrosse, ultimate frisbee, baseball, softball, football, cricket, walking, jogging and running as just a few of the activities that will benefit from the new space. He also said moving activities to the dome will open up more than 300 hours of court space in Myers Field House and Schellberg Gym for activities like volleyball, basketball, table tennis, badminton, pickleball, team building programs and indoor climbing. Pfingsten believes that a number of academic and activity classes will utilize the sports dome as well. He also wants students to understand the impact campus recreation facilities have on the student body. A digital concept of the inside of the dome. “When you consider sports clubs, intramural sports activities, outdoor recreation, fitness and wellness, and open recreation (not including Human Performance classes and Athletics), over 60 percent of MSU students currently utilize the existing recreation facilities – that’s well over 9,000 students each year,” he said. Pfingsten also noted “there is a strong correlation” between the improvements to the University’s recreation facilities and student wellness, which furthers the need to continue to enhance the facilities available. “Expanded programming, excellent services and exceptional facilities promote exercise, friendship, development of social skills and leadership opportunities and make for a healthier, happier Minnesota State Mankato community,” he said. In addition to student and campus use, the facility will be made available to the Mankato community and other surrounding communities. Early projections estimate about one-third of dome use would be by area communities renting the facility. The dome’s availability to the community should help expansion and involvement of more youth sports and attract clinics with professional facilitators to Mankato, boosting revenue opportunities for local businesses and increasing sports tourism. In the past, area youth soccer and softball teams had expressed major interest in renting a seasonal domed space for practices and tournaments. The idea for the sports dome has been in the works for almost 12 years. “The concept of a seasonal sport bubble has a long history that traces back to a failed 2007 student referendum that would have been completely student-fee-funded and a sports bubble was one component of that proposal,” Pfingsten said. The idea reignited a few years ago when health and wellness were identified as two of the University’s key strategic initiatives. Minnesota State Mankato President, Richard Davenport, suggested a personal commitment to providing higher quality academic, recreational and athletic facilities that would result in better facilities and healthier students. He felt the sports dome would be an effective mean of addressing this initiative and appointed a task force in Spring 2018 to begin exploring its possibilities. The task force, consisting of various stakeholders including administration, staff, students and student leadership, held a series of meetings between January and April. Using past student survey data from 2006, 2014 and 2017, they identified the needs of various student groups over time and collected feedback from direct user groups including Campus Recreation, human performance classes and athletic teams. Gathered information helped the task force in making its recommendations to the President’s Cabinet in May 2018. This led to the $4 million sports dome proposal, which now has the support of the students and is likely slated for construction to begin by summer 2019.